The final of the 2016 Federation Cup is upon us. It marks the end of the Nigerian top flight season. It is a double cup final – Women and Men – today at the Teslim Balogun Stadium in Surulere. The cup finals sums up the 2016 competition that kicked off on the 25th of May in various cities of the country. 22 female teams and 61 male teams picked from the 37 states (including the FCT) and started off at round 1 but we have the finalists to battle for the trophy today. The day kicks off with the 24th Women Final by 1pm. Rivers Angels will be vying for their 7th Cup title when they face Bayelsa Queens who have featured in at least 5 finals without winning any. Will there be a new winner in Bayelsa Queens or a 7th champion in Rivers Angels. 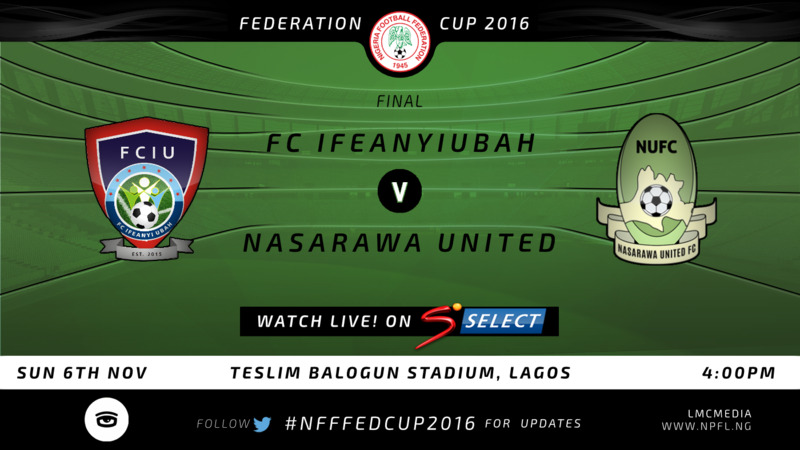 In the Men’s final, FC IfeanyiUbah and Nasarawa United will battle for the 71st Cup and their 1st ever. The winner will represent Nigeria in the 2017 CAF Confederation Cup. The Anambra Warriors would hope to consolidate their 4th place league finish with a trophy. They saw off giant-killers Crown FC in the semifinal although with various shades of controversies cleared by the NFF O&D. Nasarawa United will hope to return to the continent ASAP after a brief experience earlier in the year. The Solid Miners are yet to concede a goal in the 2016 Federation Cup. They scaled over Cup holders Akwa United and former African champions Enyimba in the semifinal. Let the better teams win.